It was about 150 years ago when a group of Chinese opera performers headed south and eventually found themselves in Thailand. To this day, after the water throwing Songkran festival, the vegetarian festival in Thailand which is known as Tesagan Gin Jay (or just the Jay Festival) is one of Thailand's largest events. 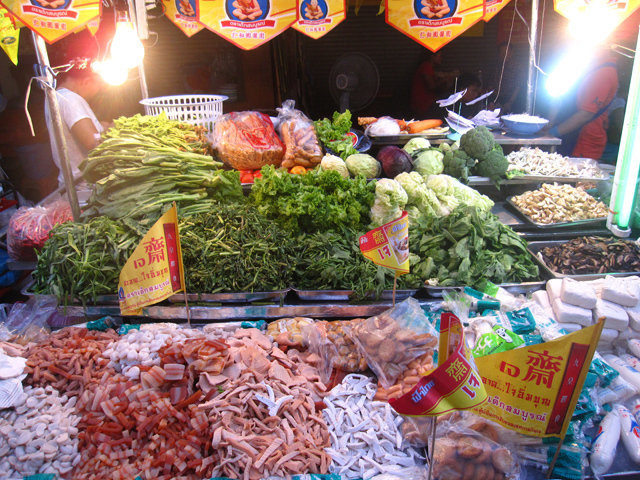 In Bangkok, the vegetarian festival can be experienced and observed throughout the city, but the main events take place in Yaowarat (Chinatown). Not everyone participates in a vow to remain pure for the nine days, but quite a few Thais make the decision to eat vegetarian for the duration of the festival. 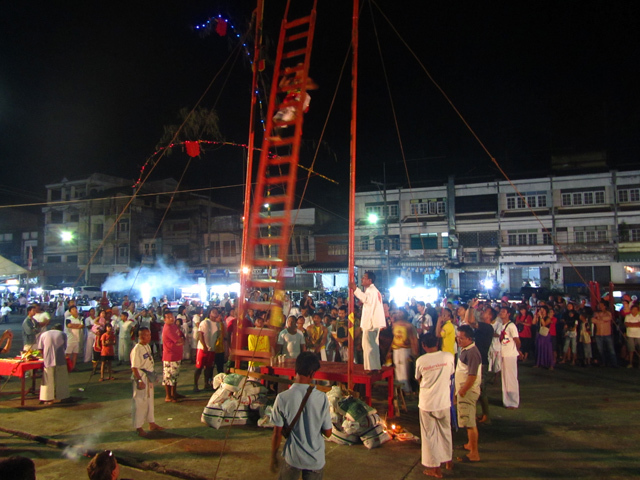 A select few people known as Mah Song choose to participate in rituals of self flagellation during the vegetarian festival. The people who practice these actions must be pure without being married. They are put into a spirit induced trance at a Chinese temple by conducting a series of procedures and chants. Eventually the person begins to shake his head from side to side and his eyes roll about almost to an unconscious state. The Mah Song then perform body mutilating rituals like walking on fire, sitting on chairs full of nails, climbing knife blade ladders (pictured above), piercing their cheeks with giant objects, and slicing their tongues with axes and double bladed saws. The extremely graphic procedures are dictated by the spirits that are said to possess those who participate. If you can stomach it, watching some of the gore in person is really something interesting to see. Again, the largest parade of humans slicing themselves up is in Phuket, but you can also catch a glimpse of it in other cities and some places around Bangkok. While the majority of people do not participate in the flagellations, many Thai Chinese do choose to refrain from eating meat. Travelers that happen to be in Thailand during the vegetarian festival will be blessed with an interesting event to observe, and an entire new array of vegetarian Thai food to sample. Yellow Flags - Safe from Meat! Many street vendors change their entire menu to accommodate to the those who Gin Jay (eat the Jay festival). You may be thinking, vegetarian food? It sounds pretty lame. Ok, while I don't think it's as good as its meat filled counterparts, they do come up with some really good things to eat. Various kinds of fake meat (protein or flour dumplings) are actually molded into the shapes of real meat and colored to make it look authentic. What started off as a cleansing festival has morphed into an all out vegetarian smorgasbord that includes all kinds of unhealthy snacks and deep fried goodies! This years festival took place from the 26th of September until the 6th of October 2011. The vegetarian festival in Thailand takes place annually sometime around September or October. 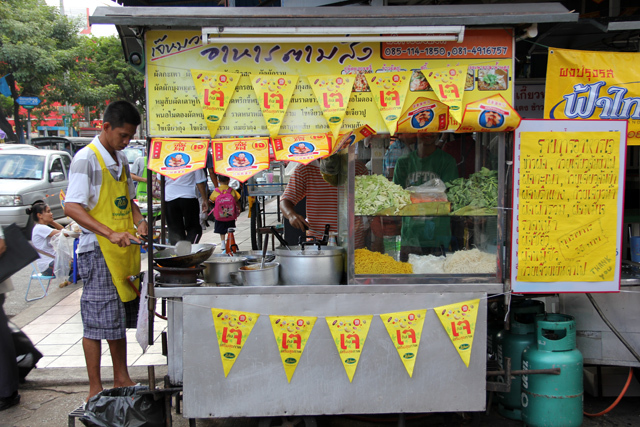 If you happen to be traveling in Thailand, make sure to check out some of the events and eat some vegetarian food. The festival sounds fantastic. My girlfriend is vegetarian and so by default am I most of the time. As such this festival would be perfect as you can’t go wrong with Thai veggie food. Just wish we were there right now. 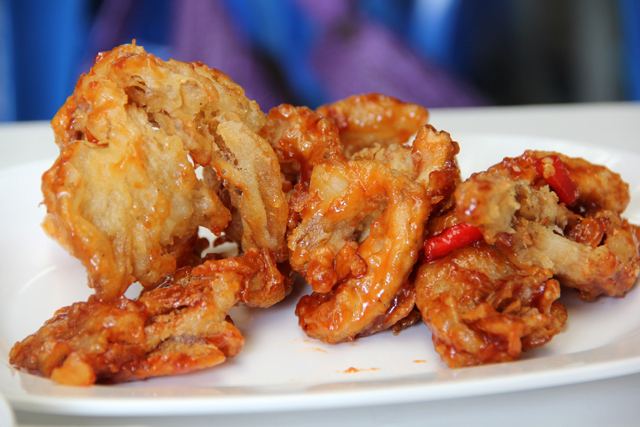 Deep frying vegetables isn’t a bad way to attract the carnivores! Yah, sometimes Thai vegetarian food is so good, it’s even hard to tell it’s vegetarian! Hopefully you and your girlfriend can make it to the vegetarian festival next year. I’m glad you did too. I’m not much for veggies, but I did have a great vegetarian run for the 7 weeks I was in India. Great to hear that Beverley! I know that you will have a fantastic time eating in Thailand when you get here. Man this is gonna delay my trip ! I have major hearing loss and tinnitus ! I cannot be anywhere near events like this ! The fukkers light off fireworks like mad ! Damn ! I’m living in the southern Thailand. 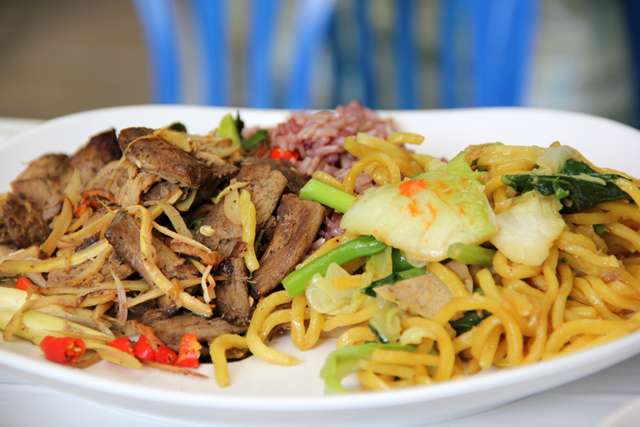 In year 2013, the vegetarian festival will start on 5th October until 13th October. I’d really like to be there for that… the food, I mean — and not the flagellation.